It’s been quite a while since we’ve made the trek to Fort Mason to see a show at Magic Theatre. When we got notice about the world premiere of John Kolvenbach’s new play Reel to Reel “the story of a fifty-five-year marriage as told through the mundane sentiments of recorded conversations, arguments, and household noises” we were intrigued, so we headed to the Marina for a night of drama talk and drinks. K: I really loved it. I don’t know if it’s partially because I’m about to get married, so this look at what happens when two people build a life together felt particularly poignant, but it definitely struck a chord. Both in the way it explored the idea of how no one can truly understand someone else’s relationship, but also in touching on the scary idea of what happens when you lose the person with whom you’ve built your life. B: It was a really heartwarming show. In the final monologue the older Walter (Will Marchetti) talks about these mundane moments which are what made their life together so beautiful, and that’s really what this play is about. These precious innocuous details of everyday life that make up a relationship. K: They did a beautiful job developing the relationship between the two characters. I felt very invested. I was almost on the edge of my seat, which is weird since in so many ways it’s a very simple show. It speaks to how well it was written and acted. I was just intrigued. B: I feel exactly the same way. 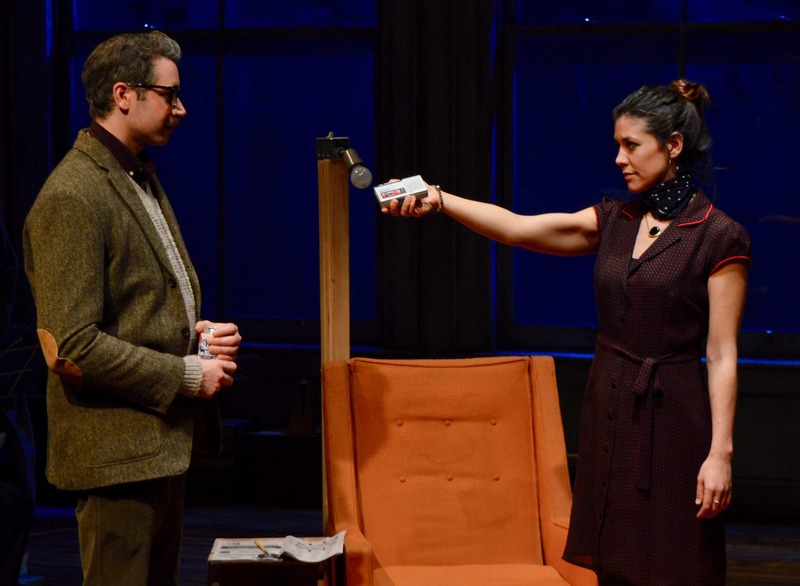 If you told me what this play was about – we get to watch the lives of two people with a relatively normal life grow in their relationship over a fifty five year period – I would think it is going to be a fairly dull play. But it wasn’t at all. K: The humanness of story was so interesting. It was also really well cast. The younger and older version of each character looked like they could be the same person. They also did a good job having consistent physicality and mannerisms. Everyone created such deep characters that they were able to make simple interactions complex. It was interesting, endearing, sad and funny. I was even a little heartbroken at the end. B: I got teary eyed too. I also appreciated that they did a lot of interesting technical things for such a simple play. The way they used recordings and did live foley effects on stage while playing multiple characters was innovative without being in your face. Getting to see all those tiny pieces of their life together, and the way they amplified them by amplifying the various sounds of their relationship, made it a really rich story. The Verdict: Go see it! It would be a perfect Valentine’s date if you’re into kind of thing. Either way it’s generally a very well acted and heartwarming show about love and relationships. The Drama Talk: It’s always fun when theater pushes you to take particular notice of a sense. John Kolvenbach’s Reel to Reel asks audiences to reflect on simple sounds, and in doing so creates a rich auditory experience that pulls viewers into a more intimate understanding of the life and relationship of Walter and Maggie. Each character is played by two actors who help the story jump around fifty five years of moments in their relationship. While the love story itself isn’t remarkable, it’s the simplicity of the story and the sounds in it that makes this play so poignant. The cast does a great job creating detailed and intimate characters that draw you into the scene. This combined with the creative use of recordings, live foley effects, and a quick script make for a light and refreshing night at the theatre. The Drinks: After the show we headed to one of our favorite bars in the city, that also just happens to be at Fort Mason, The Interval to chat about the show. We ordered drinks that were both classic and complex (Brittany got the Improved Calvados Cocktail and Katie got the Hacker Club – we can recommend both) and we toasted to love, sound, and a fun night of drama talk and drinks. Reel to Reel runs through February 25th at the Magic Theater on Tuesday – Sunday nights. Tickets available through Magic’s website range from $30-$75. There are also some tickets available at the moment through Goldstar starting at $20. Drama Talk & Drinks: In Event of Moon Disaster "If you want to get to heaven, get out of this world."